Perfect for restaurants, beauty salons, medical offices and other businesses that want a pay at the table solution or want to bring payment directly to their customers. Our short-range wireless terminals use proven BlueTooth & WIFI technology. 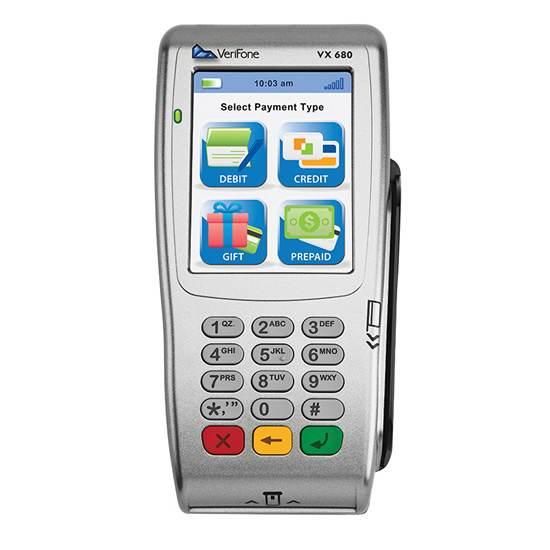 Carry brilliance and complete transactions in a small, portable device – the VX 680 BT & WIFI, allows you to have a wireless device within a 500 square feet radius Ideal for businesses that has their office in the back or are unable to run cables to the front desk, Also for businesses who want to offer pay at the table service. The VX 680 boasts a powerful processor for ultimate processing speed. Merchants using the VX 680 keep lines moving so consumers don’t have to wait. Comes with a 3.5″ touch display of vibrant color and backed by the VX Evolution platform.